Mostly cloudy, breezy and mild conditions are expected this morning. Scattered, light showers with an occasional rumble of thunder are possible. A dryline will approach northwest parts of the region later this afternoon, before retreating back westward after sunset this evening. Isolated-scattered thunderstorms may develop on the dryline, but uncertainty regarding development. If storms were to develop, they’d have the potential to become very strong or severe. 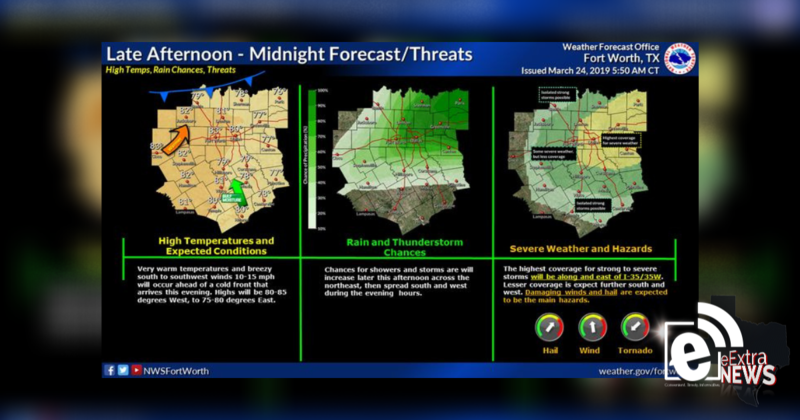 The main threat would be from large hail and localized strong or damaging downburst winds for areas mainly north of I-20 and west of Highway 75 late afternoon through late evening. Otherwise, it will be warm and breezy with highs 65 to 75 degrees.